The tenth full-length feature from heavy metal rocker turned writer-director Rob Zombie, 31 (2016), plays it too safely to be anywhere near as effective as the 102 minute undertaking clearly desires to be. Coming recently off of the subtle, restrained and daring The Lords of Salem (2012), Zombie’s latest seems like a jumbled montage; a collection of greatest cinematic hits. Regardless, the grainy, brazen approach of uncountable films from the 70’s is utilized beautifully throughout the presentation. Such is present in nearly all of Zombie’s big screen thrillers. Even though this particular focus has become a familiar staple of his photographic vision, it is a consistently strong point of the production. The gorgeously gritty cinematography from David Daniel makes this aforementioned attribute all the clearer. With some classic tunes fueling the soundtrack, courtesy of Chris Harris, John 5, Bob Marlette and Zombie himself, the illusion of stepping backwards four decades becomes all the more immersive. But, there is a reinstatement of such Zombie tropes as maniacal clowns, road trips, a simple set-up and a Halloween setting. Such restrains the imagination, and overall enjoyment, greatly. We are even awarded the obligatory first act gas station stop, another Zombie and general fear narrative practice, before the terror commences. What also hurts the labor, and endures as another Zombie custom, is the frequently trite dialogue. The speech hits all the expected expository topics. But, it does it without a shred of thoughtfulness or insight. Such is especially suspect given that the endeavor opens with an appropriate, haunting quote from the German-language auteur, Franz Kafka. Such gives way to what is undoubtedly the highlight of the movie. This is a disarmingly twisted, attention-grabbing address to the audience. Such is via the most fascinating antagonist we uncover, Doom-Head (in an arrestingly berserk portrayal by Richard Brake which gives us one of many glimpses into what this endeavor could’ve been). The sequence is also artistically gripping. Shot in stark black and white, it promises much more than what Zombie ultimately delivers. Though the guttural energy evident herein is fairly unwavering throughout, we can’t help but feel disappointed. This is as the rest of the affair gives us nothing else that garners our interest so ruthlessly. Yet, the biggest obstacle here is not so much these elements. It is Zombie’s refusal to give his protagonists any dimension. Such is all the more perplexing when he goes out of his way to infuse an extraordinary amount of invention into every one of the myriad villains which dominate his latest project. Moreover, the central characters are treated, in another manner frequently found in the grindhouse fashion Zombie is going for, as no more than possible victims. Though such completes his B-grade, antiquated prospect, it makes it impossible to become fully engaged in what is occurring. Adding to this distraction is Zombie’s difficulty in building and sustaining a continual wall of suspense. The most we get is an incredible idea, image or quick, sadistically gratifying moment of slaughter before the story goes back on itself. From this point it plods along. This is until Zombie’s next stab at trepidation fills the screen. Zombie chronicles Charly (in a depiction by Sheri Moon Zombie that is watchable but, never harrowing or unique). Alongside four other carnival folk, she is, in an arrangement so quick and vague that it successfully captures the confusion the team five entities must be feeling, kidnapped during the early hours of October 31st, 1976. True to the custom of photoplays like James Wan’s brilliant Saw (2004) and Paul Michael Glaser’s adaptation of Stephen King’s The Running Man (1987), those who have been abducted are made to take part in a wicked game. The name of such, which we learn little more about than the fact that it signifies “war”, grips the title. What else we unveil about 31 is that the five unwilling players must survive twelve hours. This is in a desolate building, the ins and outs of which they know nothing about, against an endless landscape of fiends with masks and painted faces. All of which are out to kill them. The story is routine. Yet, it has a likelihood to be worthwhile. 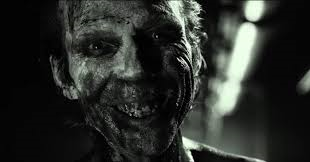 Zombie’s fairly resourceful, yet never bold enough, screenplay has its impressive morsels. But, the arc holds to the basic structure of so many horror exertions beforehand. This can be seen as another of the genre customs Zombie appears so intent on respecting. But, such creates an equally standard pace. This is evident as much of the first half hour rolls by with our leads driving along in a white van. During this era, we cover the essential informal bits, and playful subject matter, noteworthy in far too many slasher efforts of the past. The esteem Zombie parades in such an arena is appreciated at times. Yet, there is too much of an over-reliance on it here. Such is unsatisfactory given the sheer creativity we know Zombie is capable of evoking. His striking, frequently lavish, direction only proves the flare he contains in this area. To its credit, the ending is solid. This is as much in what it tells us as what it leaves unsaid. All of the actors and actresses we encounter are obviously enjoying their turns. Malcolm McDowell as the eccentric Father Murder, who acts like one of the privileged and powerful French aristocrats in a novel by the Marquis de Sade, is the most proficient and intriguing in this category. Jane Carr as Sister Serpent and Judy Geeson as Sister Dragon follow suit in somewhat similar roles. The more blatantly unhinged representations, such as Pancho Moler as Sick-Head and David Ury as Schizo-Head, fare nearly as well. The victimized Jeff Daniel Phillips as Roscoe Pepper, Lawrence-Hilton Jacobs as Panda Thomas, Meg Foster as Venus Virgo and Kevin Jackson as Levon Wally bring remarkable life to their one-note classifications. Likewise, the editing by Glenn Garland is spectacular. The art contribution from Kevin Houlihan is certainly eye-catching. Siobhan O’ Brien’s set decoration and Carrie Grace’s costume design are equally stunning. The make-up department, composed of a dozen individuals, is undoubtedly a highpoint. Zombie leans on them throughout, expressly with his antiheros, and they deliver delightfully well. Zak Knight’s special effects are seamless and credible. The optical component of this group, the collective contribution from eleven people, is just as authentic. In terms of sound, stunts and camera usage: the piece is just as operative. Though this is a mid-level opus, I enjoyed it as a whole. This is despite the fact that it is oddly timid. Such is in the liberal use of gore one would expect from Zombie. Much of this, I presume, would have to do with the several cuts made to the flick. This was done to avoid the NC-17 rating. Maybe if a version with everything intact was offered it would make the endeavor feel more singular, comprehensive and courageous. But, I don’t know if it could completely take away from the commonplace sense which hangs over the proceedings. Being among those who can say they helped crowdfund some of the $1.5 million dollar budgeted epic, I am still full of pride for my involvement in this construction. But, there is also a part of me that cannot deny that this is a stylistic regression for Zombie. He stays unwaveringly in the comfort zone. This is where he provides solely what he believes fans want from his moving tales. It may be pleasing, but it feels like compromise. It is this silent pandering which keeps this merely good exercise from living up to its potential as a great one.